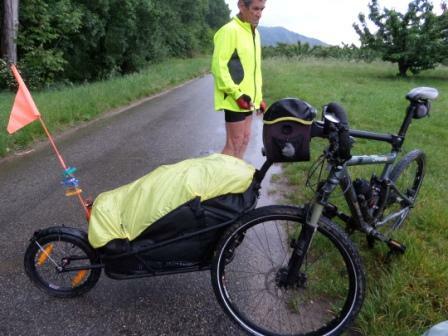 Elisa & Valentin have cycled around Scotland with their bike and trailer UNO 100. After a few weeks, they decided to reach Holland by taking a boat from Newcastle, in England. 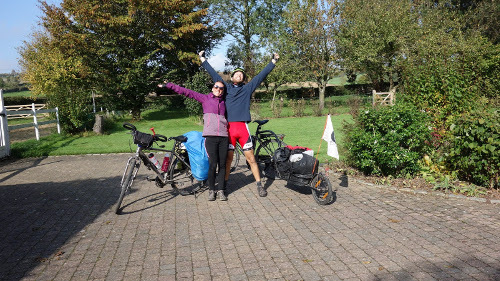 “We cycled in Holland for about 300km before the rain pushed us out of the country. We managed to sleep once in the open air but there is very few wild space in Holland so it’s quite difficult to find a space with a tent. Everything single space is used, either by houses or by fields. In Brussels, we stopped at some friends’ house and discovered the city. The center was beautiful and we had a very nice weather. 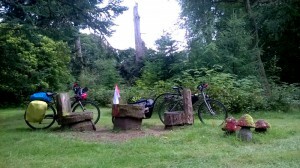 After that we cycled through Belgium and met some amazing forests along the road. We spent one night in a camping site in a small village. 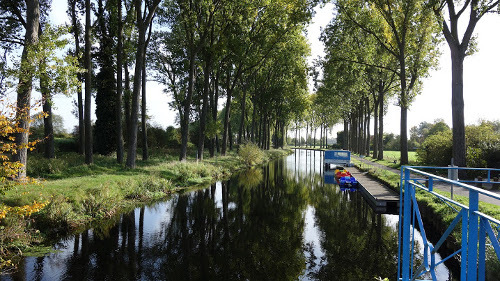 To get to Lille, it was possible to cycle along a canal. It became very hot and sunny, we even had to find our sunscreen again, at the bottom of our bag. In Lille we met some family, they cycled with us for the last 30km. 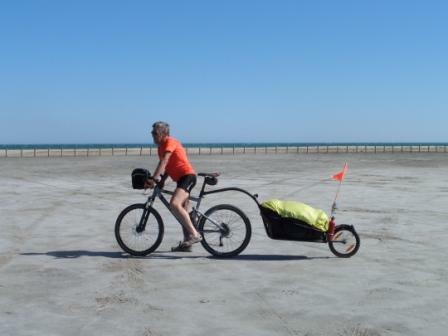 In all, we cycled for 2080km with our UNO 100 trailer and are quite proud, as we very seldom cycled before that. 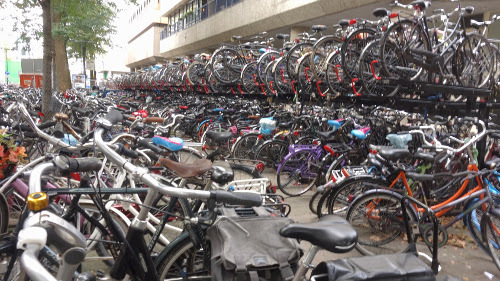 Holland is the country of the bike with its numerous cycle paths and ferries to cross the many canals along the way. It is very nice to cycle there. Unfortunately, you have to make sure to choose the right season and pick up places to stay at night. 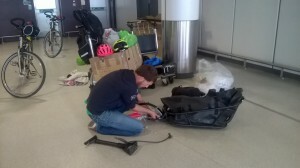 Elisa and Valentin chose to travel by bike and UNO 100 bike trailer to cross Scotland. They have already travelled in far away countries, such as New-Zealand, Madagascar and Senegal, it’s the first time they will travel by bike. 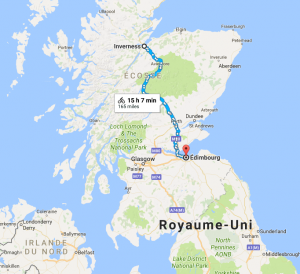 After setting up their Aevon trailer directly at the airport, they began to cycle in the direction of Inverness, a trip of about 350km. “Our nights here were sometimes hard and particularly cold. Going bivouacking is not easy, as we’re being attacked by the ‘midges’. This morning it was only 4 degrees when we woke up. But the sun is up and we haven’t had any rain yet, which seems incredible. 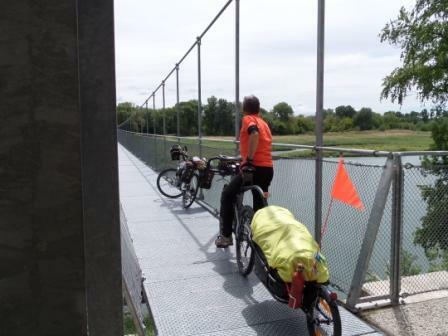 We followed the cycle paths all along the way and the landscapes are beautiful. Tonight we’ll sleep at someone’s home, so we can take a real shower. On our way, a couple of Scottish people invited us once to take a shower at their place, we felt very welcome. Their accent is sometimes hard to understand, even if we speak English. Often we don’t understand a word they say. Travelling by bike is a very nice discovery and we love this rythm. After only a few days, we feel like we have already travelled for several weeks. The trailer follows us, Valentin sometimes reached 58km/h downhill with it. The UNO 100 Aevon trailer can carry up to 35kg of luggage for an initial weight of only 7kg. The hitch attached to the seat post makes it particularly easy to handle. You will find the three bike trailers of the brand : the KIT L80, the STD 100 and the UNO 100. The KIT L80 is in aluminium and has a shock absorber. Completely foldable, it will get into the trunk of your car or on the train or the plane with you. The waterproof bag can reach a 100L capacity. The STD 100 is in aluminium and also has a shock absorber. Its waterproof bag an reach an exceptional capacity of 145L and can carry up to 45kg . The UNO 100 is in steel, it will be perfect for your trips on the road, as it has no shock absorber. The main feature of Aevon and which makes it a famous brand in the field of bike transport is the system of the hitch on the seat post of the bike. It gives perfect handling ability to your bike, you can make a U-turn on difficult tracks and even ride with your mountain bike. Aevon trailers are equipped with a single-wheel, which makes it perfect in all types of situations as the trailer follows your every movement. Finally, the Aevon brand is the only one to offer top-range models for your trips around the world when you need total trust in the material. Aluminium trailers are very strong and their frames have followed globe-trotters on the most difficult tracks : in Latin American or in the middle of Asia. The shock absorber offers great confort and is deeply appreciated by the users. Come and meet our team during the Eurobike to discover our bikes trailers or just to share your latest travelling experience. The Aevon team has developed a longer beam to adapt its trailers to more specific bikes. Fat bikes with their big tyres and oversize frames, 29″ bikes or city bikes equipped with a rear rack will all be able to ride with an Aevon trailer. By extending the beam, Aevon follows the trend with more and more 29″ bikes and more and more fat bikes on the market. Depending on the height of the rack, some bikes needed to remove the rack in order to adapt an Aevon trailer, this is no longer a problem. The beam is the system connecting the frame of the trailer to the seat post of the bike. The hitch then links the beam to the seat post. This system is particularly efficient as the bike remains easy to handle in all circumstances. Mountain bikers can still ride on all types of tracks as the trailer will follow them anywhere. Bike travellers choose Aevon brand so they can leave safely with a high quality material. The only remaining difficulty will be to choose between the three Aevon bike trailers, all different : the UNO 100 in steel is perfect for a road use, the STD 100 in aluminium can be used for mountain biking with a shock-absorber, the KIT L80 in aluminium is entirely foldable to follow you on the plane or other means of transport. Whatever your bike trip project, you will find the one that suits you the best.